Pick Gonzaga and bet against Villanova in your NCAA pool. Act like a hedge fund manager and pick Gonzaga to win it all. 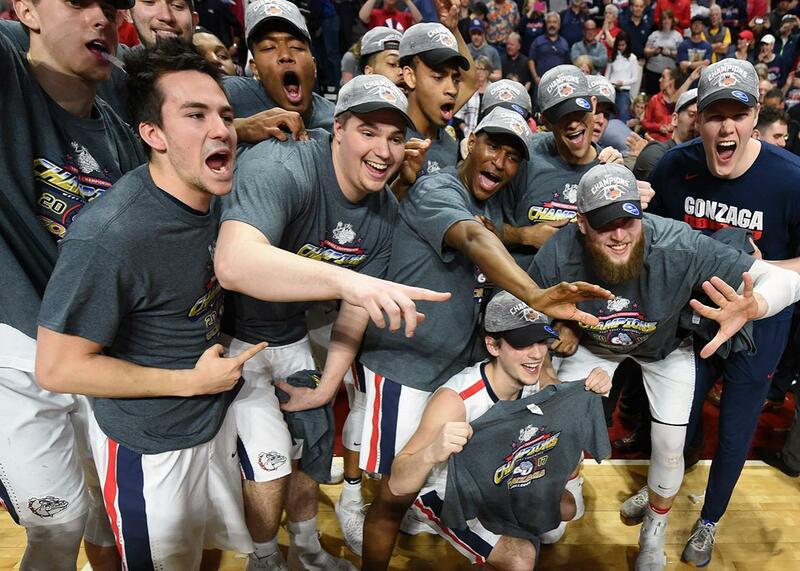 The Gonzaga Bulldogs celebrate on the court after defeating the Saint Mary’s Gaels 74–56 to win the West Coast Conference Basketball Tournament on Tuesday in Las Vegas. A version of this article originally ran in 2009. In 2010, our advice to bet on Duke paid off when the Blue Devils won the title. Our suggestions to pick Texas in 2011 and Ohio State in 2012 did not go quite as well. (The Buckeyes, at least, made the Final Four.) Our picks from 2013 to 2016—the Florida Gators, the Arizona Wildcats, the Arizona Wildcats again, and the Virginia Cavaliers—all made the Elite Eight. Our second choice in 2016, Villanova, won the national championship. Choose wisely! As it turns out, the wisdom-of-crowds information is extremely useful. The statisticians and expert bracketologists I talked to all urged one central point: Don’t think about guessing the most games correctly. Instead, think about finding “bargains” in the bracket where collective wisdom runs askance of more objective measurements. Exploiting games where your fellow bracketologists are likely to guess wrong, even if the odds of that happening are still against you, will give you the best shot at jetting ahead of the pack. An NCAA bracket, then, is more like a long-shot stock than a game: The odds of winning may be low but the big pot makes the gamble worth it—if you know how to maximize your investment. Again, your overall strategy should be to look for situations where the national bracket values a team much higher than the objective statistics. (I should stipulate that all of this advice assumes standard NCAA pool rules, where the points for a correct guess double each round, from 1 point in what the NCAA calls the “second round” to 32 for the final game.) For example, as of 2:20 p.m. Eastern on Monday only 6.9 percent of all the participants in ESPN’s Tournament Challenge have picked Gonzaga to win the tournament—the right-most column on this table. Pomeroy’s log5 analysis of the tournament, by contrast, gives the Bulldogs a 20.5 percent chance of winning it all, the best odds of any team in the field. This makes Gonzaga a decent bargain—while cold-blooded, numerical analysis gives the Bulldogs a roughly 1-in-5 shot at the title, only 1 in 15 people have picked them to win. As such, Gonzaga is the most undervalued asset in the 2017 NCAA Tournament. On the other hand, Villanova and Duke—the first and third picks on ESPN.com—are not a bargain at all. In fact, the Wildcats and the Blue Devils are both overvalued by the crowd. While 16.2 percent of ESPN users like Villanova, Pomeroy’s log5 analysis gives them a 10 percent shot; Duke is the pick of 12.2 percent of ESPN’s bracketologists and has just a 3.2 percent chance of winning it all by Pomeroy’s metrics. Biostatistician Bradley Carlin, who co-authored a 2005 paper on contrarian strategies in NCAA brackets, suggests a “champion-only” technique. While most people spend a lot of time puzzling over potential first-round upsets, the mathematical reality is that it’s difficult to win a pool without securing those boffo championship game points. The payoff for risk-taking also increases in later rounds. Consider the first-round game between No. 5 seed Notre Dame and No. 12 seed Princeton. Just 17.1 percent of ESPN players predict that the Princeton will pull off the big upset while Pomeroy gives the school a 31.3 percent chance of knocking off Notre Dame. On paper, that differential looks like a good bargain. But consider that this upset will reward the lucky Princeton backer with a mere one extra point in a standard office pool. If Notre Dame wins, Princeton supporters are suddenly missing an important player in the bracket. Other than Gonzaga, there’s one more decent bargain in this year’s field. If you don’t like the Bulldogs, go with Louisville: Though the No. 2 seed Cardinals have been picked to win the title by just 2.5 percent of ESPN.com competitors, Louisville has a 5.1 percent title chance according to Ken Pomeroy. West Virginia is also slightly underrated by the crowd, with ESPN.com users giving the Mountaineers a 0.9 percent shot to win while Pomeroy has them at 4.2 percent. Another long shot that could come in (but probably will not): Wichita State (0.3 percent on ESPN.com; 3.3 percent from Pomeroy). Who are the worst bets in the field? Other than Villanova and Duke, you’ll get crummy value by backing a pair of blue bloods: Kansas (11.9 percent on ESPN.com; 5.2 percent from Pomeroy) and UCLA (8.8 percent on ESPN.com; 1.8 percent from Pomeroy).